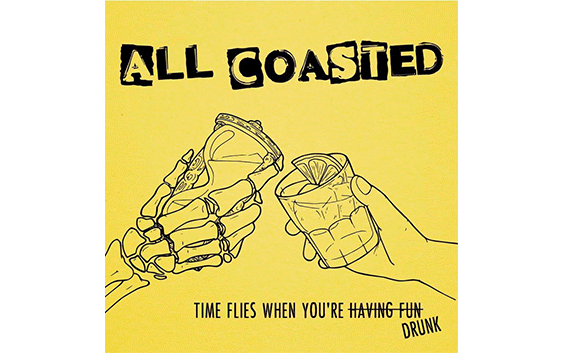 Tom told me to take a listen to the new album by All Coasted, a band from Vicenza under the influence of the 80s and 90s punk rock straight outta California. And well, when I press play, I have been transported from northeast Italy to some kind of skate park under the sun and near the sea. A part from that, let’s talk about this new album by the four punkers, Time Flies When You’re Drunk, nine tracks that pass by so quickly thanks to the light hearted punk rock sound but that always strike a chord in my heart. The album starts with ‘Just Half a Pint’, track that creates the right atmosphere which is followed by ‘Two Wild Dogs’, in my opinion one of the best songs in the album. ‘It Is for Life’ is exactly the style that defines the band, a completely and fully NoFx-ish song. Then it is time to hear ‘Deep on My Skin’, and its ska sound, which recalls the ska punk of the best 90s bands: I can’t resist! The album ends with ‘Loyal to the Shield’, the most significant and powerful song among the nine, Well done guys! I have listen to this album and I have found inside my teenage years, the NoFx, Rancid and everything that made me fall in love with punk. Therefore, I just want to wish all the best to All Coasted!